Alejandro Manzano, Fabian Manzano and Daniel Manzano. The one-night-only show will mark Boyce Avenue’s fourth local appearance in six years following its sold-out concert at Resorts World Manila last Dec. 30, 2013, also produced by Ovation Productions, and its headlining tour with American Idol winner Kris Allen and the dance troupe Jabbawockeez on Feb. 5-6, 2010, one year after its local debut on Feb. 16, 2009. 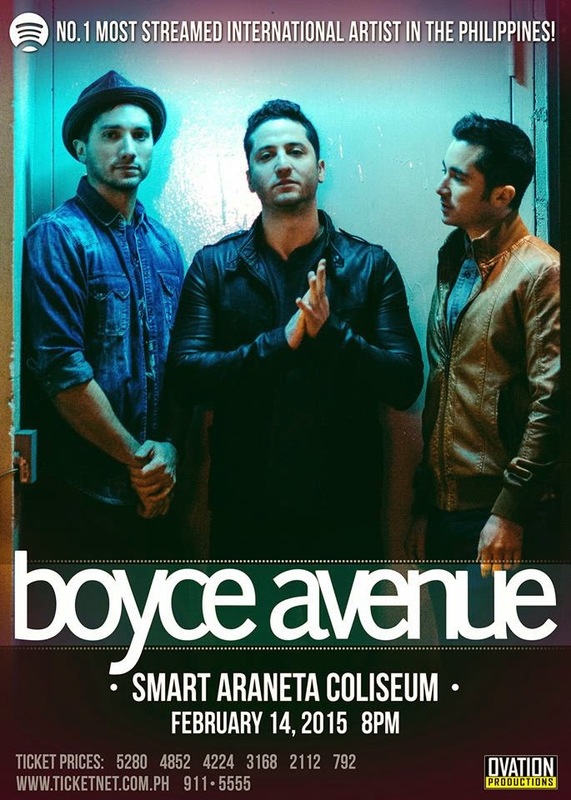 As its first-ever arena show in the Philippines, the Big Dome gig is expected to attract a huge attendance from a cross-section of music lovers who have passionately followed, along with millions in other parts of the globe, Boyce Avenue and their music online through their YouTube channel. Formed in October, 2004 in Sarasota, Florida, Boyce Avenue is composed of three Puerto Rican-American brothers who first came together as a band when Alejandro Manzano (lead vocals, guitar, piano), Fabian Manzano (guitar, vocals) reconnected with their elder brother Daniel Manzano (bass, percussion, vocals), who moved back to Florida from Massachusetts after graduating from Harvard University Law School. The group, named after a combination of two streets where the brothers grew up, took its most formative steps toward becoming a band by continuing to write original music and performing local shows. In 2007, Boyce Avenue showcased their emotive, radio-friendly alt rock on YouTube with a series of videos of them performing acoustic versions of their songs as well as covers of their favorite songs by other artists, such as Justin Timberlake’s “Love Stoned,” Rihanna’s “Umbrella” and Coldplay’s “Viva La Vida” among many others. The videos instantly shot to sky-high popularity on YouTube and, to-date, Boyce Avenue has over 1,000,000,000 viewers on YouTube and over 5,500,500 subscribers– making it one of the top artists of all time on YouTube. It has likewise gained 500,000 Twitter followers and 2,500,000 Facebook subscribers that account for a strong and solid digital fan base. Other unforgettable Boyce Avenue covers include “Use Somebody” (featuring Hannah Trigwell) by Kings of Leon, Rihanna’s “We Found Love”, “Demons” by Imagine Dragons, David Guetta ft. Usher’s “Without You”, and Katy Perry’s “Roar” (featuring Bea Miller). While producing the videos for YouTube, Boyce Avenue remained committed to create original material for its debut album, completing the recording of its last three songs in October 2007 – “Dare To Believe,” “On My Way” and “Hear Me Now” (piano acoustic). The album, titled “All You Meant To Be,” was released on March 25, 2008 and was well received in the market and got positive reviews in industry publications, while its songs were featured in various MTV programs. In their desire to connect with their online fan base, Boyce Avenue shifted their focus on touring, starting in early 2009 when the group performed for an estimated 25,000 over four headline shows in the Philippines, followed by a series of headline tours in the United States, Canada and Europe. They returned to the Philippines in 2010 to play festivals with Kris Allen and The Jabbawockeez during the MusicFest 2010 concert at the McKinley Hills concert grounds in Fort Bonifacio, Taguig City. Over the past three years, Boyce Avenue has played for over 350,000 people in 20 countries and 5 continents, including the United States, Canada, Australia, Asia, Brazil, Europe and the United Kingdom. On Aug. 9, 2011, the band left Universal Republic and began producing its CDs through its own label, 3 Peace Records. Boyce Avenue’s EP (Extended Play), “No Limits,” released on April 24, 2014, contains more upbeat pop tracks than their previous work, including seven original tracks produced by the band, with “I’ll Be The One” co-produced with Milkman and “Scars” with Ryan Ogren. A special tribute came from Louis Tomlinson of One Direction, a vocal fan of Boyce Avenue, when he arranged for the band to open for One Direction during its debut “Up All Night Tour” in Great Britain and Ireland in January, 2012. In 2014, Boyce Avenue was nominated for the Teen Choice Award for Choice Web Star: Music. Catch Boyce Avenue LIVE in Manila at The Big Dome on February 14, 2015 and make Valentine’s Day a memorable experience!